At the end of March 1943, citizens of Columbia had just heard news of the latest weapon released by the U.S. War Department: the bazooka. The last few days of the month brought news of a heavy air raid on the German capital of Berlin by our allies of Great Britain. In this small rural town of 1,500, residents turned to area farmers after food rationing began earlier that month. Limits on beef, lamb, butter, and cheese were announced, but many were grateful that poultry was not affected. Folks were still talking about the blackout the town had participated in recently as a drill for possible air raids. Local Boy Scouts were called upon that evening to deliver messages around town and were amazed at how exciting, scary, and dark the town was. During the precautionary drill, streetlights were extinguished and dark shades were placed in windows. The musical “Oklahoma!” opened on Broadway that week. Jimmy Durante and Garry Moore premiered in new radio shows, and the variety show “Pabst Blue Ribbon Town” could be heard on CBS on Saturday night, hosted by Groucho Marx and guest starring Virginia O’Brien, Donald Dickson, and The Robert Armbruster Orchestra. The weather that March weekend had been particularly mild, and shop owners on Saturday evening noticed potential customers on the sidewalks wearing lighter jackets. 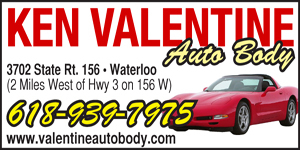 Spring was surely upon them and thoughts of warmer weather and Easter, less than a month away, were in the air. The State Theater, located at the corner of Main and Legion, had hosted a large group of patrons for their Saturday afternoon matinee. Following the newsreel, which featured President Roosevelt and news of food shortages, lend lease foods, victory gardens, ration coupons and U.N. flags, Bette Davis appeared to suggest the giving of war bonds as gifts. A Looney Tunes cartoon featuring Daffy Duck was followed by another exciting chapter of the “Batman” series titled “The Electric Brain.” After laughing at the latest “Our Gang” short, the crowd watched coming attractions followed by “Lassie Come Home,” the main feature enjoyed by matinee attendees that day. Some youngsters not able to attend the matinee that afternoon may have been busy up the street taking piano lessons at the home of Miss Mamie Weinel, who gave lessons in her big white house near the corner of Main and Whiteside. After the matinee ended, some customers might meet at the Columbia Grill, next door to the theater, where customers could gather for a sit-down supper or dish of ice cream and maybe a Cherry Coke. Cars parked across the street and farther south might park in front of Dr. E.T. Lark’s home, located at Main and Cherry, where the First National Bank drive-up facility would later be built. Dr. Lark was a trusted physician who had delivered many Columbia babies and treated many an illness. He also kept monkeys in a cage behind his house for experimentation. The monkeys almost always attracted the attention of passersby. 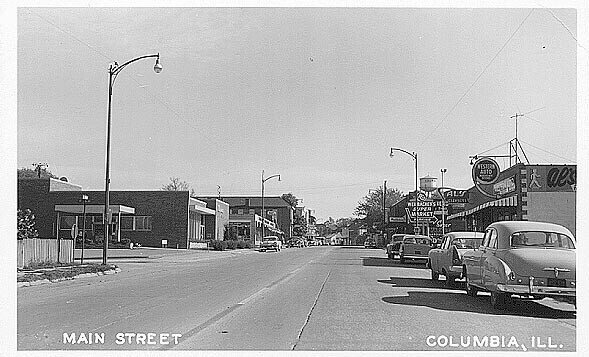 Walking north from Dr. Lark’s house on the west side of the street, shoppers would pass an entire block of businesses, later torn down to make way for the new City Hall and fountain. Faust’s Dry Goods offered fabrics and all types of sewing needs. Also on the block was Mr. Hill’s photography studio, a millenery shop for purchasing hats and dresses, and a small shop where customers could buy homemade pies and cakes or sample desserts and have a cup of coffee. Passing on across Cedar Street, sidewalk traffic would pass Dr. Kohlenbach’s office and home. It would be common on Saturday nights to see families parking along Main Street, getting out of vehicles and going in different directions. Farm families finished with the day’s work would come to town to stock up on items the farm didn’t provide or to relax a little. Mothers hurried along to the 100 block of North Main to shop at Vogt’s Department Store, which offered dry goods, hardware items, and groceries. This building would later house Greatting’s Market and Mattingly’s Jewelry. Two blocks north was another well-known department store: Weilbacher’s, located where a real estate business now stands. Both department stores enjoyed a steady business despite being competitors and both would stay open until 9 p.m. to accommodate those who shopped later in the evening. After purchasing her groceries and other needs at the department stores, the lady of the house would often stop by Koblitz’s Bakery across the street from Weilbacher’s to pick up dessert for Sunday dinner or a special weekend gathering. Koblitz’s site later became home to the brand new Monroe National Bank building, built in the 1950’s. Fathers might drop their family members off and drive north to Weinel Hardware, or travel further north to stop at Ludwig’s Saloon (now Tiny’s). Men might even meet their wives at Mrs. Vogt’s confectionery on the northeastern side of the street, where Vogt’s IGA was later located. Young folks hurried across the street from Vogt’s Department Store to catch the 7 p.m. movie at the State Theater, travel to Jake’s Place (later Albert’s Floral) to get a hamburger or ice cream, or join their mothers in one of the department stores to check out the toy department or candy counter. Older folks might pause in front of the new State Theater and recall earlier days when movies were shown at the old Turner Hall on a certain night of the week. Going farther back to the days of silent films, some might recall the first movie theater in Columbia, The Hippadrome, located in the current Naumann building that would later house various businesses such as Oerter’s Saloon, Knott So Shabby and Artistic Hair Design. The Hippadrome showed the latest silent films accompanied by mood music played on a piano. As the evening came to a close, passers-by might see children hurrying past the Dough Boy statue on Legion Avenue to meet up with their parents, glancing at the bank clock affixed to the corner of the First National Bank building at the corner of Legion and Main. Traveling south, one would pass Grob’s Furniture and Undertaking and Feige’s blacksmith shop. Further south, across the street from Dr. Lark and the monkeys, was Roessler’s Coal and Ice Distributers. Fathers might finish up their beverage at Tunze’s, which would later become Greenfield’s. As they went outside to meet their families for the ride home, they might recall earlier days when the streetcar traveled up and down Main and might notice how some of the track has been removed for the scrap metal drive and the war effort. As local stores began locking up for the evening, it was common to see young gentlemen and their dates leaving the local eateries and ice cream shops to catch the 9:30 theater showing of “For Whom the Bell Tolls,” starring Gary Cooper and Ingrid Bergmann. Although the town, population, and business district have changed considerably over the years, many of the buildings and places haven’t changed much. 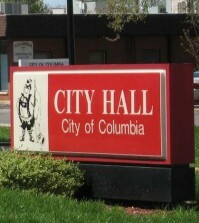 One is still able to imagine a time when Columbia’s Main Street was a thriving, bustling place to be on Saturday night.